Arrive at Tanjung Bus Station – Kuala Trengganu. Depart for Kuala Terengganu airport. 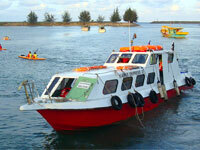 2 way transfer - Half hour Taxi from Airport to Marang Jetty – RM40 per pax (min 2 pax). Boat transfers will be arranged by the Resort.